Given the questions of expertise and community that follow, I'll begin by acknowledging how little there is in my background to account for my producing a book on ceramics. I’ve never worked with the medium, nor had I written a word or read about it in much depth until relatively recently; beyond a personal fondness for the few handmade items I own, gifted from friends and dabbling family members, it’s simply not been a subject of much pressing concern. In witnessing its surge in popularity over the past few years, though, I've come to develop a genuine investment in the medium, cultivated on the following bases: First, I’m interested in trends, in the shifts and swings of popular tastes. On levels both obvious and implicit, they’re instructive, insofar as even the most apparently frivolous fad reflects its cultural surroundings, and so by identifying the factors involved in its emergence, one gains a clearer sense of the broader climate. Generally speaking, this interest needn’t require that one like the items in question – it’s simply a matter of treating them seriously enough to develop a useful context. But in this case, as I've made my way through the flood of contemporary ceramics being shown on gallery pedestals and store displays, I've found that I've consistently, genuinely enjoyed much of what I was seeing. 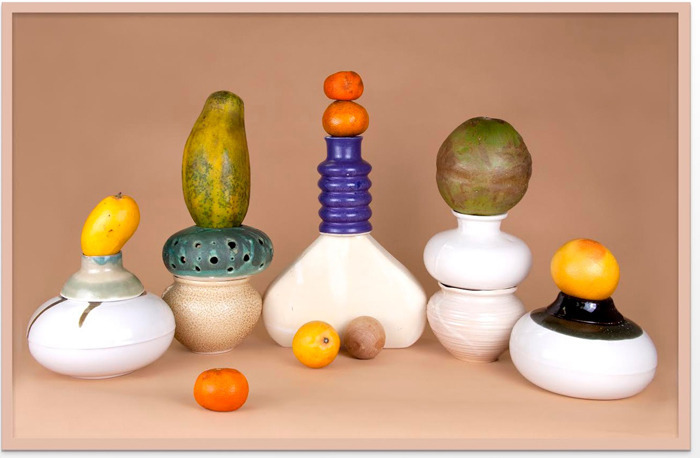 Of course, as a stranger to the medium, my appreciations laid entirely in superficialities: instinctually finding one artist’s approach to vessel forms “interesting,” declaring another’s use of glazes “nice,” and so on. Nothing terribly intelligent – but then, one can hardly expect his readings to bear much insight when they entirely lack point of reference. So, unable but eager to contextualize what I was seeing, I began to seek out writing on this rise in ceramics output, only to find a strange disparity: for while recent years have seen the medium embraced by an increasing number of practitioners, audiences, and institutions, these developments seemed to have been largely ignored by critical writers, particularly those focused on contemporary art. There had, of course, been a series of bylines confirming how “hot” ceramics are at the moment, but such offerings by their very nature tended to be brief, surface-level, and, depending on the disposition of the writer/publication, vaguely dismissive. The same has generally gone for discussions of individual artists and works that made use of the medium. “There is still a realm of the unknown, in terms of judging the quality of ceramics,” ceramicist Margie Hughto remarked in 1979. “The number of ceramicists working continues to expand, and yet the criticism evaluating the work does not.”(1) Fast-forward 35 years, and we seem to find ourselves facing the very same problem. Though disappointing, this critical distancing is understandable, maybe inevitable, for two reasons: First, it seems clear enough that many have dismissed this resurgence as a trend (which, of course, it is) rather than a development (which it also is). That the trend is centered upon a craft medium only makes matters worse. This much is probably familiar to most of us: while ceramics has been the occasional subject of art historical consideration, it has more often been its scapegoat, with the perceived gap between art and craft remaining as obstinate as it has been enduring. This is because it is also functional, as such hierarchies help define and reaffirm art’s ostensibly higher aims. For many, the working assumption continues to be that because craft methods are based in tradition and typically aimed towards function, anything produced through those methods must be conservative, marginal, anachronistic; where art critics concern themselves with authorial intentions and theoretical implications, craft is outwardly driven by inherited standards and technical skill, and so dismissed as antithetical to progressive artistic aspirations. This prescribed imparity seems to have resulted in a kind of stalemate, with one group of people dismissing recent developments out of a willful incuriosity, while those who might be open to a more thoughtful conversation have no meaningful discourse to which they might contribute – and this, ultimately, is my point of both interest and concern: for when our perspective is shaped by the same dogmatic rigidity that we outwardly deride in craft and other supposedly “sub-art” conversations, things quickly become compulsory, prohibitive, and utterly boring. Whether ones inclination is to embrace, rebuff, or simply ignore an artistic thread, those judgments should be qualitative, not preemptive; in dismissing an entire medium as a non-starter, one does not counter a stagnant discourse, but rather actively promotes one – and such seems to be largely the case, unfortunately, with the critical reception of recent ceramics. To be clear, I’m not saying that there hasn’t been any worthwhile writing done on the topic. There has been, and continues to be; the reading list offered at the back of this book, comprised of recommendations from the artists featured herein, confirms as much. Nor is this meant to suggest that the conversation surrounding new ceramics requires some kind of overwrought academic reframing. Rather, this call for greater criticality is simply meant to acknowledge two beliefs that I’m content to treat as facts: First, that our experience of art is deeply enhanced by – and, at times, dependent upon – our being able to place what we encounter within a field of precedence; and second, that the way we view, comprehend, and talk about artworks develops largely as a function of what we read and hear about them. Meaningful assessment requires context, some kind of grounding to be used in assigning value, recognizing achievement, and advancing a constructive discourse. Part of that grounding, of course, comes through ones own extensive, attentive viewings, but such sensibilities inevitably gain refinement and perspective in being informed by external readings. All of which is merely to say that while the conversations surrounding this ongoing ceramics resurgence needn’t be excessively stringent, they should be made ample enough to be useful: a source of clarity and, ideally, a vehicle for greater enjoyment. This balance, it seems to me, would need to be struck at even the most basic levels of discussion. For instance, in this context, the term “ceramics” itself warrants qualification: for while recent years have found any number of self-identified ceramicists being assimilated into a fine art setting, it’s worth pointing out that much of the ceramic work being shown in galleries at the moment has been produced by artists incorporating the medium into their own established, decidedly “non-craft” practices. This is significant for a few reasons. First, on a purely formal level, one often finds in “art ceramics” a less rigid sense of craftsmanship; untethered to the medium’s conventions, fine artists generally seem comfortable diving straight in, their interests perhaps lying less in technical accomplishment than in using the material to its and their own ends. As is true in any medium, of course, a willfully de-skilled approach doesn’t necessarily render a work any less competent than those made according to more orthodox sensibilities. It does, however, speak to an entirely different set of concerns, and should be assessed accordingly. Recognizing a distinction between “standard ceramics” and “art ceramics” – both of which, it should be noted, are equally removed from what one might call “non-functional crafts,” wherein a work produced using craft techniques eschews utility but isn’t meant to bolster a larger theoretical conversation – is interesting also for the challenge it presents to commonly held notions of authenticity and tradition. The two basic arguments regarding the liberties taken by “art ceramicists” are instructive, if fairly straightforward: For those committed to ceramics as a craft – that is, a received tradition centered on hard-earned, long-held standards of technical skill – this apparent laxity on the part of “visitors” to the medium (to borrow ceramicist Peter Shire’s euphemism for dilettantes) can take on ethical implications, with artists’ indifference to inherited culture coming off as a presumptuous and potentially misrepresentative brand of aesthetic tourism. (2) For those outside of that community, however, this lack of rigidity can actually serve as an entry point, the basis for an enlivened and potentially illuminating encounter with a medium too often obscured by narrow preconceptions. To approach ceramics as an instrument rather than an ideology means allowing for an experimentalism rarely afforded the medium within a traditional craft context. In imbuing craft materials with the permissions of the artist’s studio, these “visitors” can potentially broaden its scope, inventing new forms, uses, and methods of display. In then presenting those results to an audience, they further encourage us to think beyond presumed hierarchies, challenging suppositions as to what ceramics is, does, and looks like. While each argument carries its own broader implications, what I find most interesting is that, in selectively integrating craft materials into art conversations, “art ceramics” actually embodies perennial truths about each respective field. First, it confirms one of the essential functions of a progressive art practice: advancing ones project through the appropriation of peripheral sources. Fine art has always been a tradition grounded in stealing and synthesis, its practitioners constantly reaching beyond their immediate surroundings for material to uproot, recontextualize, and cross-pollinate to some fresh, exciting end. These external sources are often currently unfashionable or culturally removed – and prior to this recent resurgence, one could argue that ceramics had long been both. But today’s “art ceramicists” are only the most recent in a lineage of artists who’ve used the medium to their own particular ends: Malevich and his fellow Constructivists, for example, produced ceramic vessels characterized by an inventive assemblage of forms, retaining but demoting functionality in favor of singular designs that might better suit a modern Communist society; Bauhaus potters sought to bridge the gaps between art, craft, and industry by updating traditional forms with stylized geometric designs, creating work that was at once modern, utilitarian, and geared towards mass production; second-wave Futurists like Tullio D’Albisola reinforced the movement’s glorification of speed and industry by crafting fluid, highly glazed forms aimed at conveying a sense of visual movement and mechanistic velocity. In each case, we find artists using ceramics as a means to an end, drawing on particular aspects of an outside discipline in order to advance their own broader, ongoing projects, and it’s within this longstanding tradition that our current wave of “art ceramicists” might be best understood. 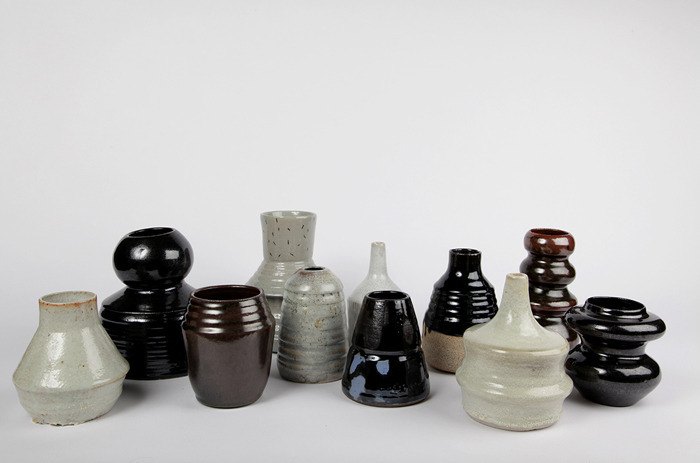 In this sense, however, their selective assimilation of ceramics also confirms a fundamental truth about the medium, and indeed, about craft methodologies in general: namely, that despite an apparent grounding in tradition, ceramics is an exceedingly fluid material, polymorphous in form and application. Although popular conceptions both in and outside of fine art circles remain predominated by the notion of ceramics as a humble outlet for hobbyists, a closer look reveals a medium at once highly mobile and emphatically modernized, its materials and methods readily absorbed into fields ranging anywhere from electronic appliances and cutting implements to construction supplies and biomedical materials. One needn’t look further than these very pages to confirm as much: while our stated interest here may lie in craft’s perceived relationship to contemporary art, situating ceramics within active artistic practices quickly leads us to consider its roles in industrial design, environmental activism, identity politics, and lifestyle aesthetics, to name but a few broader applications. In each case, some inherent quality of the medium – its chemical inertness, low conductivity, high melting temperatures, organic makeup, or whatever else – has made it viable within an outside discipline. That artists today might be turning to the medium on similar terms, whether it be for its leniency, tactility, or apparent “intimacy,” serves only as further confirmation of its adaptability. 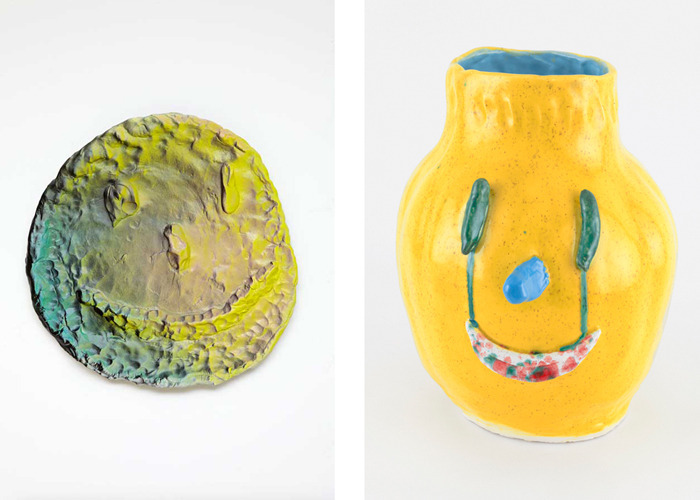 In art and industry alike, it seems, ceramics’ efficacy is often revealed not when the presentation is straightforward and “authentic,” but rather when the medium functions beyond conventional expectations. As such, the increased presence of ceramics in artist’s studios and gallery spaces, once understood as being only one of the medium’s many simultaneous, ever-evolving conversations, ultimately reaffirms the way craft functions in wider culture. Of course, to be making these points in the spring of 2014 feels somewhat strange, as most of us have been aware of the ceramics vogue for years now. While its novelty as a fashionable medium gradually fades, however, it seems that ceramics only continues grow in prominence – which is precisely what makes this the perfect moment for a shift in the conversation. For now that we’ve seen enough work to establish a point of reference, and need no longer discuss the medium in terms of its trendiness, we can finally begin turning our focus to the output itself, and in doing so, learn something from this resurgence rather than merely watch it unfold. Towards that end, the following pages feature conversations with a group of artists whose integration of ceramics into established fine art practices confirms the medium’s technical foundations while demonstrating its material and conceptual plasticity. 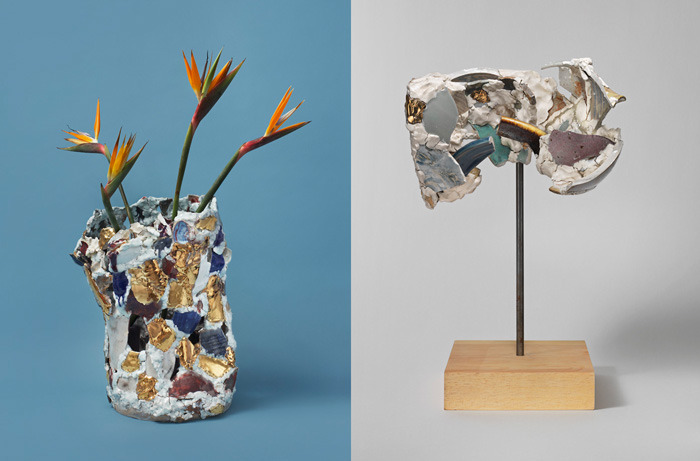 While each uses ceramics to his or her own ends, these five individuals – Robin Cameron (New York), Jessica Hans (Philadelphia), Jimmy Limit (Toronto), Dan McCarthy (New York), and Erin Jane Nelson (Oakland) – enjoy a similarly thoughtful engagement with the medium, producing work that at once references and defies tradition in the service of broader projects. On one level, these conversations reaffirm some of the qualities that have long made ceramics an appealing material to visual artists. For instance, because it’s generally perceived by outsiders as an artisanal (read: non-intellectual) medium, unburdened by the weighty cultural standards attached to “finer” art forms, ceramics can be seen to take on a kind of transparency when integrated into a fine arts practice, serving as literal means of conveyance for a wide range of conceptual conceits. So, for example, where Dan McCarthy compares the intimate, instinctual nature of handbuilding to his ongoing painting practice, Jimmy Limit can point to the medium’s role in mass production; where Jessica Hans equates her surface treatments with the textured exteriors of stone and coral, Erin Jane Nelson’s globular forms allude to Computer-Aided Design and 3-D modeling. 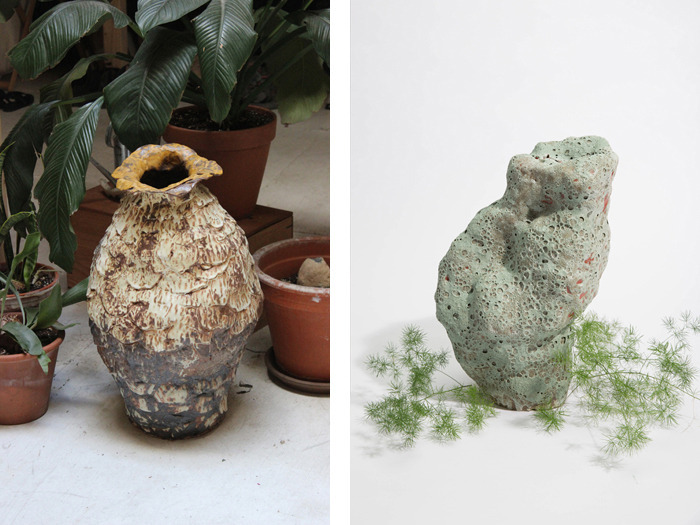 That these five artists all work regularly in 2-D formats is also telling, as on a purely formal level, ceramics have long afforded artists the opportunity to augment their compositional sensibilities by translating strategies of line, shape, and surface to a three-dimensional format, using both form and ornamentation to actively reinforce a sense of volume. Of course, for many artists, adopting the medium can also serve a basic but vital economic function, as compared to most contemporary paintings and sculptures, ceramic works are cheaply produced and affordably purchased, and can thus provide a saleable supplement to ones costlier (and perhaps less commercially viable) output. More importantly, however, these pages also lend some insight into what’s made ceramics so ripe for rediscovery these past few years. All of the artists, for instance, speak to the medium’s tactility and “intimacy” as an antidote to the dehumanizing aspects of modern industry, whether it be the designed disposability and inorganic materials of mass-produced consumer goods or the dematerializing functions of digital technologies. Along similar lines, some see the physical methods, decorative possibilities, and intimate scale of handbuilt ceramic works as a welcome counterpoint to the escalating “professionalization” of contemporary art, which finds artists outsourcing their fabrication, embracing high production values, and applying a “bigger is better” mindset to both size and expense. Furthermore, this renewed interest in ceramics among fine artists seems consistent with the post-disciplinary approach favored by so many practitioners today - a model defined in large part by (a) a renewed interest in studio-based processes and (b) a broad and permissive use of materials. Committed to concept rather than any single medium or technique, today’s artists allow their impulses to dictate their choice of materials, challenging and often disregarding conventions, contexts, and presumed stigmas along the way. In freely using whatever means are readily available, such practices encourage a leveling of hierarchies, with relationships between artistic and artisanal formats, between “high” and “low” forms, gradually shifting from oppositional to reciprocal. Finally, in a broader sense, one could argue that because industry has removed any practical need for handmade vessels, studio-generated ceramics (functional or otherwise) are now effectively luxury items, desirable not for their utility, but rather for what they represent – which makes their presence in art galleries all too appropriate. While each of these factors has likely contributed in some way to ceramics’ increased visibility, they together suggest – persuasively, I think – that this moment of resurgence might be more than a mere whim of cyclical fashion. Obviously, the implications of ceramics’ current popularity are greater than can be encapsulated in a modest volume like this one. As with any burgeoning discourse, however, our aim here should be not to resolve the conversation, but rather to enhance it. So for those readers already tapped in, I hope these pages provide moments of both corroboration and revelation. But for those of us who are interested but not yet involved, I hope these dialogues serve as both means of entry and points of departure; that, in establishing some of the pertinent terms, techniques, and references that shape these artists’ work, we might begin to develop the vocabulary necessary to respond thoughtfully to – and perhaps even participate in – what I think is a timely, logical, and entirely legitimate field of activity. As with most things, what we take away from our encounters with contemporary ceramics ultimately depends on what we bring to them. If we’re to gain anything from this moment of rediscovery, then, we must approach it from a balanced perspective: informed enough to be thoughtful in execution and assessment, but informal enough to allow for both new perceptions and personal enjoyment. Consider this book a simple offering towards that end. (1) Margie Hughto, quoted in Clement Greenberg, “Status of Clay” (1979), reprinted in Ceramic Millennium: Critical Writings on Ceramic History, Theory, and Art, ed. Garth Clark. Halifax: The Press of the Nova Scotia College of Art and Design, 2006.